Home » All of Deb’s tales of travel and tech » Medical » Natural help for burns — raw egg membrane! Have you ever burned your finger or hand on a cooking stove ? It hurts, right? We all know the feeling: the pain of the burn, then the blister. Then the pain as the blister pops and the new raw skin is exposed before it’s ready. And the possible pain and infection if the new skin becomes irritated, opens or becomes infected. Especially if you happen to be cooking eggs, or cooking with eggs at the time? Or, if you have just one egg handy, you can avoid that pain for the price of a single egg. 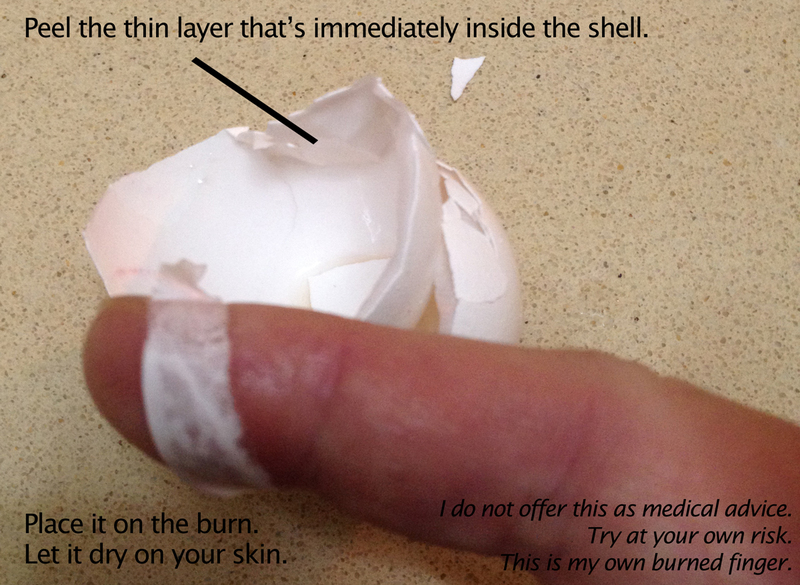 If you get burned, peel off some of that layer that is just inside the egg shell. It’s a thin solid skin, the membrane. Then just put that piece of membrane over the burn area. It’s wet and sticky so it will naturally stay on your skin if you pat it down a bit. Let it stay there. It’ll dry and stick to your skin for a while. You’ll feel it shrink and pull a bit as it dries. That’s ok. I don’t know the exact amount of time you “should” keep it on, but I keep it for as long as it stays. After it peels I just wash my hand because that seemed logical to me. You may find, as I have, that the burn stops hurting, then simply doesn’t blister! That’s it. Something in the natural make up of the egg membrane just has the healing or preventative power. I should comment that I have only used it on burns to my fingers and hands — the burns one typically gets while cooking, typically from touching a hot pot handle or the edge of a hot frying pan. I have not tried this one more burns from fire or other serious burns. I have found to be about $0.20 or 0.25 (20-25 cents US) in Central America, Eastern Europe and Israel. That’s a pretty small price to pay to avoid the pain and possible infection from a burn. And you can even cook and eat the egg after you’ve addressed your burn or wound! Note: I am not giving this out as medical advice and you use this trick at your own risk. I am just sharing something that was taught to me and has worked for me several times in the 3 years I have known about it. As I said, this was told to me by a young boy as I cooked with him, and it simply works so I am sharing it. However, looking this up on the internet, I have found some other info about the healing properties of egg membranes. This 2004 post is the well-written personal story or some travelers who have used egg membranes on their young son’s knee wounds, other kid wounds, and even on spider bites: http://www.voyage2health.com/egg-membrane-natures-bandage. I highly recommend reading it. A future personal note: When I was 17 my entire face and my hands were burned, 2nd degree, by boiling starches in a kitchen accident. I have no idea if plastering my face, hands, arms and chest with egg membrane would have healed the skin. If I was unlucky enough for such a burn again knowing this remedy, I’d likely try it. Maybe the healing power would act in the time it takes to get to the hospital. what a great idea – thanks! !